An elevator pitch is your script’s concept, boiled down to a bite-sized portion of words. Also known as loglines, they’re a bit like short sales pitches; they’re a two or three sentence long summary of your script’s plot–and they’ll dress to impress. What does this mean? It means you’ve got to sell your script in an innovative and appealing way–be it for your intended audience, your agent, a producer, an actor… In the film business, a day won’t go by in which you won’t need to be pitching to someone about something related to your script, so it’s always good to have your elevator pitch handy. It’s got to be something that catches their attention, gets them thinking, and most importantly, gets them begging to know more. Elevator pitches are called that because it should take you no longer than the time it takes for an elevator to reach whatever floor your ‘pitchee’ is going to (supposedly). The term came from the Hollywood myth that script writers used to catch execs and producers in their building elevators on purpose to pitch their scripts, and not only did the phrase stick–but you won’t get far in the world of scriptwriting without hearing this jargon being casually thrown about. The good thing about an elevator pitch–painful as it is for a socially awkward scriptwriter to voice–is that it can help you shape the success of your script. If you manage to generate some interest over your pitch, you know you’re on the right track (or at the very least you’ve got a way with words, always a useful trait for a screenwriter). If however, you’re rejected flat on your face, then at least you can go home, cry a little, then start over. Cut scenes. Shape new ones. Polish old ones. Kill your darlings–there’s a reason that’s a time-old piece of advice. And then you can try again. And again and again until your script is ready, and you’ve a new, improved pitch to try out on someone else. Pitching scripts is like testing the waters, and the more people you meet and talk to, the more your networking circle grows. They’re practically the same as elevator pitches, but they won’t be written by the scriptwriter (at least not usually). They’re extremely difficult to write, and highly underrated. To create a logline, you’ve got to compress 120 pages of script into two sentences and each word has to equal its weight in gold: Loglines have got to summarise, intrigue and sell themselves. These are the short blurbs you’ll see as film synopses in cinemas and TV guides, in Netflix descriptions and on the back of DVD covers. Loglines will give very specific information about the film without being too explicit–but divulging enough so that your audience knows what the basic plot will be about. We didn’t all go to watch Stephen King’s IT thinking it would be about happy clowns, we knew he’d be a sewer-lurking weirdo. The obstacle standing in the way of their goal (antagonist). A twist that makes your story unique. If you hadn’t tried it already, coming up with a 90 second elevator pitch is tricky enough even when you know your story inside out. So the first thing to do in order to get your pitch tight and concise, is to layout the building blocks of your plot, and then play around with the wording. Write a simple summary of your script first, even if it’s bland and boring. Then start playing with the words to make it sound a little more exotic. Let’s take a look at a few examples of successful loglines. Pulp Fiction: The lives of two mob hit men, a boxer, a gangster’s wife, and a pair of diner bandits intertwine in four tales of violence and redemption. Pirates of the Caribbean: Blacksmith Will Turner teams up with eccentric pirate “Captain” Jack Sparrow to save his love, the governor’s daughter, from Jack’s former pirate allies, who are now undead. Liar, Liar: A fast-track lawyer can’t lie for 24 hours due to his son’s birthday wish after disappointing his son for the last time. Groundhog Day: A weatherman finds himself inexplicably living the same day over and over again. Chicken Run: A dashing rooster and the hen he loves lead a daring escape from a poultry farm in 1950s England. Note that it doesn’t have to be super wordy, in fact it’s better if it’s not; be clear and concise, and remember to portray the main setup and conflict. Taglines are short (sometimes only two or three words long) phrases used to reveal the film’s nature from an advertising perspective, expressing the film’s theme by using humour, irony, double entendres and wordplay. They create buzz and sum up the tone or premise of a film. A tagline sets up a strategic and effective direction for a film and is meant to be catchy. Sometimes taglines show a film’s twist in just a few words and are an important part of the film’s marketing in the way that they’re the “face” of a film. Elevator Pitches describe your script and are used as a selling tool to engage the (financial) interest of an executive or a producer or for casting. Loglines are marketing tools devised to sell the film to an audience, and taglines are small hooks placed on film posters and film descriptions to appeal to the individual, often in the form of a word play or witticism. As hard as it is to write an elevator pitch, it’s important that your script matches your pitch. So if you have changed your elevator pitch a lot, and digressed from your actual script story to make it sound more interesting, you might just want to reconsider tweaking your script. Writing elevator pitches is an important writing exercise for anybody, as it helps single out blatant problems in your script you hadn’t noticed before. So no matter what, it’s all good practice! So, you’ve reached the end. It’s time for your protagonist to give us their last sweeping wave before the curtain falls and the lights come back on. Hopefully you’re planning on going out with a bang, but before you dust off your hands completely, there are a few things you should know. What goes inside the third act? Based on the resolution section of the script, this act is usually the shortest (between 20 and 30 pages) it’s the final twist or metaphorical battle, and then the return to home or normality (though life for the main character will never be the same again–definition of a successful character arc). This is what Snyder would call the Break Into Three. It’s the moment we’ve all been waiting for. Here your story will reach its final twist, the moment everyone’s been waiting for since you unleashed the inciting incident. It’s the climax of the story, the final battle. Your character has been pursuing a goal throughout the entire second act, and now they’ll either get it, or they’ll change the goal to coordinate better with the theme, i.e. the moral lesson they’ve learnt. If you ended the second act on a low point, now it’s time for your character to get back off the ground and re-group. During the final confrontation, the main character is forced to reexamine their beliefs. They will put everything she or he has learnt over the course of the film to good use to defeat the antagonist, always incorporating and exposing the nugget of truth, the film’s overall theme. In the Hunger Games, Katniss stops obeying the game’s rules, and starts to fight back herself, using what politics she’s learnt during the first and second act. Instead of murdering Peeta, she tricks the capitol into thinking they’d rather kill themselves by eating poisonous berries, when in fact it’s a survival tactic. Another determining factor of the third act is the character, unlike in the second act where they’re surrounded by other characters, will mostly work alone (in the absence of their mentor) against the antagonist. In the Silence of the Lambs, Clarice has to stop Buffalo Bill by herself, because the police have gone to the wrong place and Hannibal, her “mentor” didn’t hang about long to help her. Basically, your audience has witnessed your character go through hell and back, and now they’re waiting for the reassurance that it wasn’t all for nothing, that your character has beaten the odds and grown because of it, developed in some positive way. Normally, this character arc is represented through a mirror effect. For example, if the character’s flaw in the beginning was to lie or connive, in the third act the character will do exactly the opposite of his/her previous nature. The resolution at the very end will give us a glimpse of the new status quo, or the state of your protagonist’s life after all has been said and done. In the Hunger Games, the ending isn’t Katniss and Peeta defying the capitol with the berries, it’s Katniss and Peeta back in District 12 as the crowning victors, hinting at the change in Katniss as she struggles to familiarize herself with her surroundings. This–very short–section ties up any of the film’s loose ends and answers lingering questions about the plotline. It’s Blake Snyder’s final image. It’s what he calls the opposite of the opening image, the final shot that demonstrates the absolute mirror change that has occurred. In Pride and Prejudice, the opening image has Lizzie walking through the grounds of her father’s cottage, alone with her head stuck in a book. One of the final images of this film sees her walking at dawn, still alone, but then Darcy comes striding out the mist towards her. She’s no longer alone, and more than that, she’s completely changed since the opening. She’s less proud and quick to judge. Scripts which transition into films will most certainly go through test screenings to gauge the audience reaction so that producers can decide whether or not they’ll be a box office hit. Third acts and character arcs are often changed as a result of a negative test screening. In Blade Runner, Ridley Scott was pressured to change Ford’s Character into a more ironic, upbeat version than his original, darker self. This eventually affected the ending, in which the original dark ending was changed into a more upbeat one to reflect Ford’s character. Instead of dooming the entire human race, the ending scene touches on a hopeful ending in the sunshine. In Pretty in Pink, according to the original script, Andie’s character arc saw her develop feelings for Duckie, whose own unrequited love for her form the emotional bulk of the film. But when tested on audiences, this romantic development wasn’t at all favoured, and so Blane and Andie end up together. Receiving mixed reviews, some thought this made Andie’s character slightly more realistic and less fickle, because she continues to like the same character she did in the beginning, and still appreciates Duckie’s relationship. Hancock was originally a script entitled, Tonight, he comes, and Hancock’s character was much darker, dabbling between alcoholism and depression. The end result, produced nearly a decade after the script was written, became a much lighter, quirkier version than its predecessor, all for story purpose. If you’re a scriptwriter, then your main tools of trade (besides a firm grasp of English grammar–I hope) can be boiled down to having a rather overactive imagination, capable of producing scripts that think “outside the box”. If this applies to you, then congratulations. You’ve got the trickiest part down. But these scripts of yours, what are they? And by that I don’t mean you should ponder their existential nature, but rather determine the nature of their financial standing. Are you getting paid by a financial body (corporation, company or producer) to write an adapted work? Are you writing scripts to produce by your lonesome? Or are you writing your script just to showcase your skills as an in-house TV writer? Worthy as all these ventures are, you should know the difference between the two types of scripts: Speculative scripts and commissioned scripts. 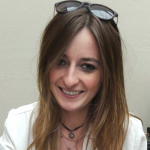 When you first start out as a screenwriter, it’s highly unlikely that you’re going to be commissioned to write a script straight away, not without someone within the industry being familiar with your work. You’ll need to have some sort of track record that sings your praises. Has one of your scripts had the rights bought? Has it been optioned? Successfully sold? And this is where speculative scripts come in. In business, speculative is defined as high risk of loss, and is applicable in this case because screenwriters are not paid to create speculative scripts. You write them “speculatively” in a whirlwind of crippling uncertainty with the faint hope of it being picked up by those producers/agencies who haven’t even solicited it in the first place. So why write them, if no one wants them? Just because no one wants it now, doesn’t mean they won’t when they read your script. Well, yes. But you won’t know if you don’t try, will you? So there’s conjecture and a lot of guesswork involved, if you have a killer idea, you should write it with or without a secure sale in place. 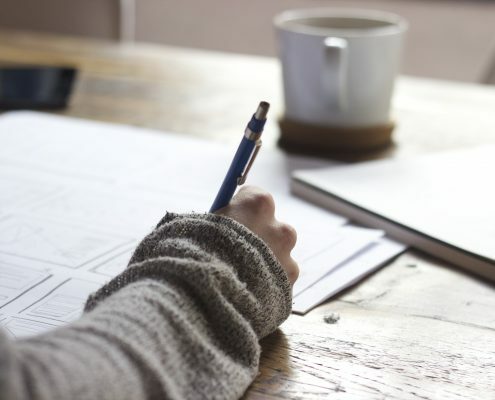 You might need a writing sample for a job application–one that showcases your comedy style and pacing for example, so that you’re commissioned for TV shows. If you’re not sure who to speculatively send your script to (it’s basically the writer’s version of cold-calling), you should start by compiling a list of producers in London. There are several bodies in London (such as the BBC) which have a few pockets of window a year in which they accept unsolicited scripts. It’s a rocky boat, though. Basically, there’s no safety in speculation. But nor is there success in waiting for a £25 k to come knocking (spoiler alert, it won’t). So if you’re in this for the long haul, you’re going to need at the very least a portfolio of speculative scripts, excerpts or not. You don’t go into other jobs without being able to showcase some sort of relevant skills, so this is the main purpose of a spec. In the case of commissioned scripts, this usually applies to seasoned writers, to those screenwriters whose work is already well known in the industry, and are paid to write the screenplay of a piece of work whose rights has been secured by a producer. With commissioned scripts, you could be asked to adapt novels or other works with award-winning potential and that are already well-known in popular culture, such as The Silence of the Lambs, or Schindler’s List. Franchises like Spiderman for example, are owned by corporations who have a team of writers with their own in-house style. If you are just starting out, you should definitely develop a library of material–at least two or three finished scripts. Professional portfolios usually contain a variety of spec features and some TV samples (spec pilots), mostly to showcase style, pacing and timing–the three things most companies look at in a writer (although ideas don’t exactly take a backseat in the decision-making, remember that ideas can be thrown about in a writer’s room). Besides, there are perks to the speculative. You’ve got the added bonus of writing when, what and how you want, even if the risks involved of getting noticed are higher. If it’s awesome, the story will speak for itself. The other positive spin is that speculative pieces can help you get noticed as a scriptwriter, if your script is circulating in the right circles. Just look at Matt Weiner. He wrote Mad Men as a writing sample in 2000. It didn’t get optioned, but thanks to his spec pilot, he was hired to write for the Sopranos. It was only seven years later that he’d proven his worth and Mad Men was made. Little Miss Sunshine was sold by Michael Arndt in 2000 for the grand total of $250,000. His script was speculative and was sent to the Endeavour Talent Agency, where it was picked up by producers. This was his ticket, as after his first speculative success, Michael Arndt was then commissioned to write Toy Story 3, the Hunger Games: Catching Fire and Star Wars: The Force Awakens. Juno started out as a screenwriting sample Diablo Cody came up with to show studios (at the time she was trying to get funding to adapt her book onto the screen) but Juno was liked so much it became a film itself. Which just goes to show, don’t knock it ‘til you’ve tried it. Check out the links below to see how you can improve your writing skills and get noticed. Film Freeway lets you check out all new and upcoming festivals near you. https://www.societyinmotion.com/wp-content/uploads/2017/07/Writers-Room.jpg 683 1024 Elena Alston https://www.societyinmotion.com/wp-content/uploads/2016/09/IMIS_Logo_Colour_Cropped-300x125.png Elena Alston2017-07-20 09:00:452017-07-17 20:46:39Speculative Vs Commissioned: Where do we go from here? 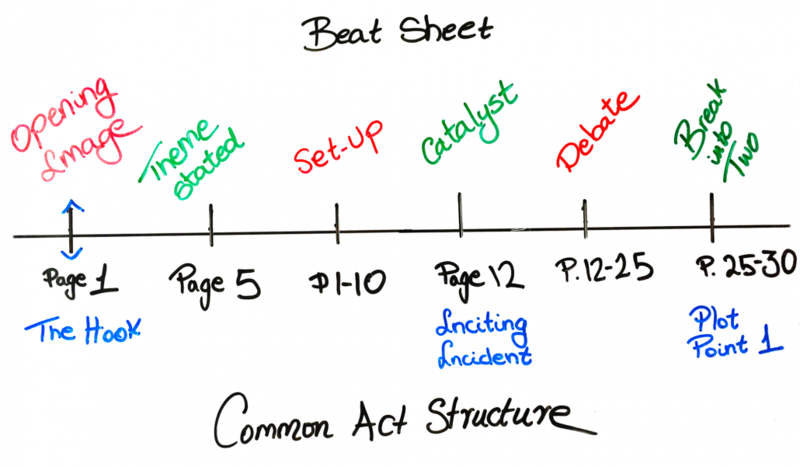 In continuation of my article featuring the first act, we’ll now move on to Act II structure. As you already know, there is no one handier to help in story structure than Blake Snyder and his beat sheet. In act I we covered the Opening Image (page 1), the Theme Stated (page 5), the Set-Up (page 1-10), the Catalyst (Page 12), the Debate (Page 12-25) and the Break into Two (Page 25). Now this time around we’ll be facing Syd Field’s ‘confrontation’ stage head on, defined in his three-act paradigm. Act two is the heart of your film, the nitty-gritty substance, the part where your character will encounter the very significance of the story and face the main obstacles heralding his or her way. It’s about fifty pages long (30-85), defines your arc, reveals the stakes, and explores your theme. Sounds complicated, right? But don’t panic. Snyder’s beats will give your script the fillers it needs to avoid any structural gaps. The B story is the supporting side story, the sub-plot to your main story. Generally speaking, B stories are murky, the grey area of solid script-writing, because your B story can’t just be about your character’s sidekick. Your B story must address your story’s theme. That’s right, the one Blake Snyder told you to state in Act I. Sometimes it runs to the rescue of your A story. In Greg Berlanti’s Life as we Know it, the A story is Holly and Eric coming together to look after their goddaughter, but the B story is the development of their relationship, which circles back and fortifies the A story. Because of their teamwork, they achieve their goal of looking after their child. Sometimes it adds heart. In Jurassic Park, it’s the arrival of Hammond’s nephew and niece, adding a nice layer of emotion to the story. Because suddenly, the film isn’t just going to be about dinosaurs on a rampage, it’s going to be about protecting the children from the rampage. It may sound like a particularly complicated Rubik’s cube, but the B story is essentially how the main character deals with all the obstacles thrown at him by the A story. It’s the emotional plotline of your story, the part with the sentimental and solid depth, whereas your A story is the action-packed objective of your story. I reckon the Fun and Games segment pretty much speaks for itself, but in any case, it’s usually the most enjoyable part of watching any film. Before any drama kicks in, the Fun and Games section makes life look pretty good for your protagonist. They’re a respite from the drama and problems to come, they’re entertaining and engaging. In Pretty Women, we see a sequence featuring down-on-her-luck Vivian enjoying the glamour of high society. She shops. She enjoys the hotel’s luxuries and nice meals. Why? Duh, it’s fun to watch. In Bruce Almighty, Bruce plays around with his powers; in the Hunger Games, Katniss is preened and primped and fed and glamorized for the games. It’s fun to write, fun to read, and fun to watch. This is the official section of your screenplay, the part where the stakes are raised against the character. The protagonist’s situation of the midpoint (whether good or bad) starts to disintegrate further. Your antagonists are out to get your character now, and whether they’re physical (another human being), or emotional (fear, jealousy), they begin to overtake the storyline. For example, in 500 Days of Summer, the bad guys close in when Tom, out of jealousy, punches a guy hitting on Summer. There is no more fun and games now, it’s downhill from there. 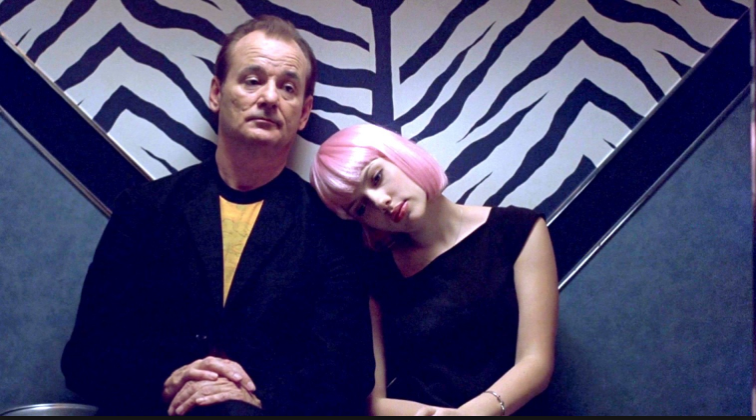 In Lost in Translation, the bad guy is time, as Bob and Charlotte aren’t going to be in Japan for much longer and their friendship/relationship will inevitably come to an end. It’s the ultimate crisis point. Here the character will either lose everything they’ve ever wanted and gotten, or they will realize that if they achieved it, it wasn’t what they were looking for anyway. It’s a false friend. It’s the moment where your character hits rock bottom and he or she is so far away from their goal, it seems impossible they’ll ever get there. In 500 Days of Summer, it’s Summer and Tom’s break-up. In the Philosopher’s Stone, it’s finding out that Snape is going to steal the stone and the only person who can protect it (Dumbledore) is gone. It’s when Han Solo is frozen in carbonite, when Harry dies in the Kingsman and when Indy’s father is shot in the chest in Indiana Jones. It’s the grievance period, the part where the protagonist tries to deal (or not) with the all is lost moment. It’s the wallowing in the utter failure before they pick themselves back up again. In 500 Days of Summer, the dark night of the soul is the part where Summer resigns her job, Tom becomes depressed and starts lashing out at everybody. In Jurassic Park, Hammond realizes the park is a failure: it’s not worth the lives lost, it’s got to be shut down. The character must understand the reason why they’ve been beaten, so that they can overcome it in full. In Babadook, Amelia realizes that because she can’t let go of her husband, she can’t defeat the Babadook and so she’s exposing her son to danger. Essentially, the answer must lie in something learned from the B story, which touches on the theme stated in act one. And with that you can relax, because you’ll have reached the end of act two. Now all you have left is your Breaking into the Finale, otherwise known to Blake Snyder as the resolution segment. The good news is that if you’ve got a solid second act, then from here on out it’s all plain sailing to the end. The second act is all about testing your character’s strengths and weaknesses, dangling their goal in front of them and whipping it out of reach again when they least expect it. It’s complicated but not impossible, and if you think in terms of a full circle, one that incorporates your theme into your B story and then your B story into the realization of your theme, well, you’re flying high. So now that you’ve got the basics of your screenplay worked out and ready, it’s time to cast your ever-eager gaze onto the art of formatting. This is possibly one of the trickiest aspects of scriptwriting to master, but only because there are plenty of differing views and techniques at large. If you grab a copy of the Hollywood Standard, by Christopher Riley, you’ll find it’s jampacked with formatting gems that will really make your life (and everyone else’s in your near perimeter) a lot easier. He covers every formatting element in existence, from transition shots to camera work–always handy if you’re a script supervisor. Today I’ll provide you with the tools to equip you in writing one scene according to professional formatting guidelines. It won’t be enough to write a whole feature or even a decent short, but keep your eyes peeled and eventually you’ll get there. Script formatting is a bit like learning to drive a car, rocky and uncertain at first, then gradually easier until one day you wake up and it’s second nature. Another practical way to go about it–hands down–is by installing Celtx (a scriptwriting software) onto your computer. It’s free, it’s easy to navigate and it segments your excessive babbling into formatted elements, practically on automatic. There are, after all, certain stylistic conventions every script must adhere to, independently of your writing style. For now though, let’s focus on the basics. Say hello to Courier 12, he’s your new best friend. 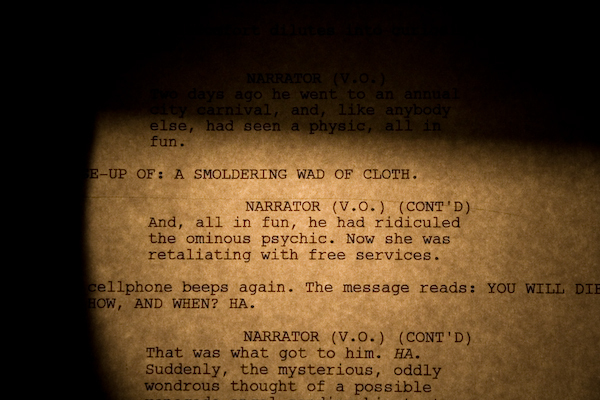 Every script is written in Courier-or a variation of the font, thanks to its clarity. But more importantly, setting is the first thing you’ll need to whack us over the head with. Bringing us to the time-old questions of who, where, when and why–not necessarily in that order. Every new scene you write–even if it’s set in the same room but at a different time–requires a heading. You’ll answer three questions (maybe more if you want to be very specific). Is the scene outside or inside (exterior or interior)? What is the specific location, a hotel lobby or a beach? Does the scene take place during the day or at night? You’ll need to insert a new scene heading every time one of these elements change. This is what Riley calls a Master Shot Heading, and anything longer than that is usually unnecessary. The code is short and sweet. Beyond that, you might be wasting paper space. The first thing to remember is that professional script-writers don’t tend to worry so much about their character’s inner thoughts for a reason. On the page, it doesn’t matter if Tom is agonizing over whether or not to jump from a balcony in a gun chase, if in the script it takes him a split-second to do so. The screenwriter must lay out the characters’ actions in a way that cinematographers and directors can easily visualize them–and quickly too. Never be ambiguous, you can’t afford to be vague for literary effect, describe exactly what is happening as if it’s happening NOW. Action is always set in real time. Writers usually break the rhythm of each action down into one or two sentences each, so that the time it takes to read the action, is how long it actually takes to carry out in real time. This is so that the reader generally has the same imaginative experience as the viewer will have. In Pulp Fiction, the writer establishes via the ACTION, that the coffee shop is in Los Angeles, it’s 9:00 a.m and the place is bustling with breakfast-goers. That’s one sentence. "Two of these people are a YOUNG MAN and a YOUNG WOMAN." Whenever we introduce our main character, you should capitalize their names once, to establish their protagonism. On Celtx, when selecting the Character from the drop box, the name of your character will automatically be centred in the document, and the Dialogue option will present itself just beneath that. Character names will always be capitalized. You can also choose to portray the attitude or accompanying action with which your character speaks with the PARENTHETICAL option. The rule of thumb “Show, don’t tell” applies to the Parenthetical option, however. Parentheticals in every sentence is overkill. Leave me alone, I'm not drunk! Leave me alone, I’m not drunk! Transitions are mostly used in scripts to define the abruptness with which each scene leads into the next. There is a lot of controversy nowadays as to whether these should only be inserted later in a shooting script, but as a writer, you might find them useful anyway. Jules finishes his burger, crumples the wrapper, and tosses it into the bin. These are the ABCs of formatting, but there’s a lot left to cover so next time, we’ll delve into the different transition shots. Meanwhile, get Celtx and start experimenting. Also, look for scripts online, you’d be surprised by how many famous scripts are just sitting there, waiting to be read. See how they separate action into sentences. Learn dialogue pace. And focus on the scriptwriter’s style. You’ll start to notice a pattern unique to each writer. The best scripts stand out not just due to spotless formatting–but also because of individualistic traits. If you read a lot of scripts, you’ll notice an improvement in your own writing within a matter of weeks. Remember, practice makes perfect. If you are interested in the world of screenwriting and film, but not sure where to start in terms of writing, you’re in luck. Your job prospects aren’t limited to being hold up in your room, agonizing over proper formatting. You could take on far more practical roles within a film production. For some, it may come as no surprise films are shot entirely out of scene sequence. This can be due to budgeting, time limitations, studio space or availability of locations, adverse weather conditions…the list of circumstances can go on and on! This is why any production needs a script supervisor. A script supervisor–also known as continuity supervisor–has a very hands-on-approach within the production of a motion picture, as they are present during all filming sequences on set. Essentially, the script supervisor keeps detailed records of dialogue, sound, set design, camera position, slate and clapperboard info, costume, make-up and hair, props and lighting. This is to ensure that filming makes continuous and coherent sense for the sake of the story. They’ll also be aware of post-production and funding, and will maintain a close relationship with directors and actors to ensure seamless coherence. Script supervisors must keep script revisions ready on-set, alongside continuity notes (usually printed on different coloured paper to differentiate from previous notes). Instead of working on a spec script, the script supervisor works on the shooting script. This falls under the camera department, and means having a good eye for the minutest of details, as well as keeping an exhaustive track of where everything was on set and how it is laid out before the next shooting day–or scene–begins. Everything has to be consistent, or the end result will suffer. In some cases (usually in smaller production or casting companies) you might also be appointed to deal with coverage. This is basically reading and analysing spec scripts with the intention of discerning whether they have potential. Script supervisors follow a set of guidelines and detail a quick breakdown of the synopsis. Note: Even though the first ten pages of a screenplay is usually all that it takes to get the yay or nay, often screenwriters don’t include a breakdown, premise and logline. That’s your job! As script supervisor, it will probably be your job to break down the script according to scene length (camera time). Generally, one script page amounts to one minute screen-time, but this isn’t always true, considering stunts or VFX requirements. This is also to help prepare running times, as later on you will also keep track of the slate/clapper information. If the screenwriter has used script writing software like Celtx, then it will automatically make each page of your script about 8 inches long. This is because each inch of the page is identified as 1/8th. Say for example, a scene is about 4/8ths of a page, in running time it translates as half a minute. If, like me, you had no idea this even existed, and especially if you wrote your script yourself, you probably find yourself acting out each and every scene whilst a slightly bewildered friend times you. In my case, myself and my co-writer broke down our scene lengths by acting them out in a small, stuffy campus room. It was time-consuming, tedious, and slightly ridiculous, but I promise you it does work. You get an idea of where things are too long and what needs re-editing, especially dialogue. 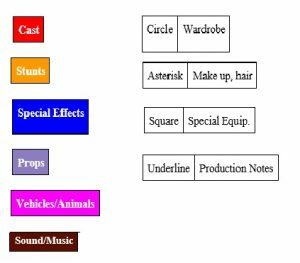 This is then checked and coordinated with previous shooting day costumes & wardrobe detailed within those marked in scripts. So you’ll need to at least understand these codes to communicate with other departments. If you’re at university, studying a Masters or Undergraduate degree, don’t limit your duties to coursework requirements, think outside the box. University is the one place where you’ll have free access to camera equipment, equipment that would otherwise cost a bomb to hire, no questions asked. Take advantage of this. Experiment. Gather a team of like-minded individuals and make that short film you’ve been thinking about. Write the script and then film it. It doesn’t matter if you’re not a script writer. Whether you’re a cinematographer, editor, or producer, you’ll figure out a lot of how the entire operation of a film works. This is something that will help you later on, especially when developing your people skills. The film industry relies on filmmaking as a group effort, particularly in terms of producing a film, location scouting, finding funding… you’ll be in constant communication. But if you get used to it as soon as possible, it will give you an edge over competitors. Besides, there are perks. Making an amateur/student film helps you test the theory. You’ll even start developing your trademark voice that will make you stand out in the future. Prop building, production, casting and filming–at an amateur level or not–especially when you’re just starting out can be an extremely rewarding experience. Why wait until you’ve graduated to start out? If you’re not in full time education, write to, apply, or volunteer at casting, production and film companies. Offer your script-revision services. Take a course in script writing (or whichever role you’re interested in). Once you’ve got a few months experience under your belt, start applying to paying jobs. Start networking. Scour the internet for film events happening around your area. Write a short. Get your friends to help you film it. Ask for help. Ask for feedback. Send your film to festivals, competitions, upload it to the internet. Network. Create a website for yourself. Network some more. Whatever you do, don’t give up. Perseverance is key and breaking into the film industry is difficult, but you know the saying, nothing worth having was ever achieved without effort. https://www.societyinmotion.com/wp-content/uploads/2017/05/Script_Supervisor_script_on_set.jpg 3456 5184 Elena Alston https://www.societyinmotion.com/wp-content/uploads/2016/09/IMIS_Logo_Colour_Cropped-300x125.png Elena Alston2017-05-23 09:00:152017-07-10 08:44:28What does a script supervisor do on set? In a technologically geared world, where VFX and Motion Graphics are taking the film industry by storm, proper character development is sometimes left at the wayside. Complex antagonists and detailed backstories have also taken a hit, alongside emotional depth and realistic personalities. If you’re flicking through your script as you read this, and realise that you can smell a happy ending from a mile off, it might be time to revise your characters, as he or she could be a bit too predictable, and a bit too picture-perfect. The same goes for your antagonist. Most people in real-life aren’t evil for the sake of being evil–they don’t have trademark wicked cackles and devious master plans. People have complex backstories that make them the way they are–and this is in constant development. The human brain is a slimy network of grey matter (literally)—there really is no black or white. And that’s okay to portray in your characters. As I’ve said in other articles, conflict is the main driving force behind any story, and it’s the writer’s job to identify this and provide it through your character’s actions. Characters who don’t face conflict because they’re just so amazing at everything they do won’t make the audience worry about their outcome. A litany of failure and flaws is essential for keeping our interest in the film alive, and makes the protagonist’s eventual success that much sweeter. Perhaps it’s because we identify with their flaws, as we see our own shortcomings reflected back at us. A good example of character building is in Lost, ABC’s drama series. Through a series of flashbacks, we can see how Jack Shephard is emotionally scarred by his father’s expectations, and how this shapes his entire thought process, fostering his exaggerated hero complex. Even his surname represents his position of leadership amongst the other crash survivors. Charlie, on the other hand, is the ultimate underdog. Battling against drug addiction, through his flashbacks we come to understand how he used to protect his brother against it. The same goes for Kate: she may be manipulative and a murderer, but if you delve into her backstory, you come to realise she killed her stepfather to save her mother. A sign of good character-building is when your audience sympathises with their plight because their backstory is realistic, detailed, and ultimately touching. It’s the Walter Whites and the Tom Ripleys of the world that cause a reaction within us. Characters with messed up minds and real-life human flaws. Give your character a history. Think about what it was that made him the way he is. If he’s going to be cruel, what event-or sequence of events pushed him over the edge? If you can create a character which draws up mixed feelings–someone who we hate and pity and admire all at the same time, then you’re well on your way to creating multi-dimensional protagonists. What were your character’s parents like? Did she/he have a positive/negative relationship or is your character an orphan? Where did he or she grow up? What was the environment like? Did they grow up poor, wealthy or comfortably middle-class? How has this had a psychological effect on him or her? Do they laugh easily? Andy Dufresne barely cracks so much as a smile all through Shawshank Redemption, yet all Harley Quinn does in Suicide Squad is smile, one is endearing, the other vaguely psychotic, yet both are equally interesting. No two people are truly alike, and that is the beauty of character building–you have complete freedom to create as you will. The same goes for the way your character speaks. Think of two people you know, and listen closely when they speak. Just as their accents might differ, one might drop the F-bomb five times in one sentence while the other might laugh too loud, a bit like a hyena. Is this endearing, or annoying? What reaction does it cause? Think about your characters, emotionally. What scares them? What is your character’s biggest regret? Is there something missing from your character’s life? First impressions always count and are a great opportunity for writers to show just exactly what is special about the protagonists. We sympathize immediately because he represents the middle-class monotony of suburbia. There’s an almost claustrophobic feel to the way Ball introduces him to us. As readers, we feel just as trapped as Lester does. Juno Macguff, from Diablo Cody’s Juno, is pretty charming for a sixteen-year-old, and her quirky way of introducing herself gets us hooked from the get go. The first few minutes even include a flashback with backstory. We see Juno staring with rapt attention at a battered-looking leather recliner dumped on the side of a curb. It all started with a chair, she tells us. And then we immediately jump to a flashback, featuring the real chair in question. Note the creative way of linking a present object with the story line? When we meet Captain Jack Sparrow in Pirates of the Caribbean, however, no flashbacks are needed. He comes storming over the seas like a pro, with background music rising impressively, only for the shot to reveal his sad, sinking boat. His comic timing and debonair style are both portrayed within a matter of seconds, and the audience can’t help but like him the moment he steps onto the pier. Remember, making characters people find relatable, someone to root for, is a big part of what makes a script successful. This doesn’t mean that you’ll spew out everything you know about your character in the first five minutes of your screenplay. You’ll have to reveal snippets as you go along, using different techniques. Films are undoubtedly a visual medium, and a powerful one, but they aren’t born that way. Every film starts off as a script, and what lies within the pages of your screenplay determines or defies the quality of its visual twin. You should sequence your story into manageable, bite-sized portions, which when transferred to screen, will look as seamless as they read. As readers, we don’t stop to question the nature of these steps, they usually do their job and do it well; they cajole us into turning the page. In screenwriting, you’ve got about ten pages to capture an executive’s attention; seriously, no more and maybe less before they continue slogging through the slush pile. The key to success? You’ve got to open with a bang. Ten pages isn’t much, so you really need to give us something to react to, something big. Remember Lost, by J.J Abrams and Damon Lindelof? The first scene opens to the protagonist coming to on a jungle floor. That’s enough to get us asking questions, but when he makes it out onto a beach, we’re slapped in the face with the answer: a crashed plane, an exploding engine, people screaming, getting blown up. All within three minutes of screen time. That’s all it takes for the audience to get hooked. In features, the first act comprises of about twenty or thirty minutes’ screen time, the written equivalent of which is thirty pages. This is perhaps one of the most important beats of your script. The first scene acts as a hook to catch the reader/viewer’s attention. The opening image of Jurassic Park sets the premise immediately. Man versus Beast. In Gone Girl, a wife snuggles up to her husband whilst he tells us (via voiceover) how he pictures cracking his wife’s head open and pooling her brains for answers. This is genius in the way it points to the film’s major premise. Is he mad? What answers is she hiding? The opening image should make us ask that question, what’s going to happen? And we don’t want to be spoon-fed the answer either, we want to be strung out, wherein lies the suffering, lies the pleasure. This is where you lay the foundation for your story. Where is the story set? What is the character missing from his/her life? What is the film going to be about? Essentially, you are presenting the protagonist’s world to the viewer as it is before the call to adventure. The theme usually appears in the set-up, and is the underlying message of a film, spoken aloud to the protagonist to challenge the way they think. It’s a message that usually falls flat on the main character in the beginning, because they don’t have enough context or personal experience with it to yet understand its value. In other words, the character is oblivious to it. In Jaws, Brody’s wife waves him off to work, telling him to be careful and he laughs it off. “In this town?” Right. Gravity‘s theme is pretty straightforward: Ryan needs to let go. We see this figuratively and literally throughout the film. Ryan has to let go of her daughter’s death, just like she’s got to let go of Matt, in order to survive. In 500 Days of Summer, Tom is hopelessly optimistic about Summer, but it’s his sister who sets up the theme of the film by pointing out that just because Summer shares certain aspects in common with him, this doesn’t make her his soulmate, a truth Tom painfully comes to terms with. Otherwise known as the Inciting Incident, or call to adventure, the catalyst is the first event or action that will show that change is coming for the character. That life as he or she (or it) knows it, will end. In Shawshank Redemption, Red puts his money on Andy to crack during his first night in his cell, but Andy stands his ground and doesn’t make a peep. Inglorious Basterds’ catalyst hits when Lander asks LaPadite if he’s harboring the Dreyfuses under his floorboards. His family won’t come to harm’s way if he collaborates, setting Shosanna’s fate into motion. Usually there is some debate surrounding the character’s catalyst. Should I leave my nice comfy hobbit hole to go on what appears to be a suicide mission? Wouldn’t I be safer here, eating crumpets and sipping tea? But not all debates revolve around a character’s departure. In the Hunger Games, for example, the debate is not whether Katniss will participate in the games (she doesn’t have a choice) but if she’ll win. That’s why it’s important you have a general idea of these beats, but don’t use them to define your screenplay. This is the end of act one. It’s the ultimate game-changer that will propel your character into act two, the cataclysmic decision, the point of no return. Usually there’s new surroundings to be explored and it’s the driving force that carries the protagonist into act two and dumps him in harm’s way. In Jaws, the hunt is on once a reward is put in place for catching the killer shark. In Django Unchained, Dr Schultz cuts Django a-I’ll-scratch-your-back-if-you-scratch-mine deal he can’t refuse. In Juno, the protagonist ponders over abortion, but then decides to give the baby up for adoption. Remember this is just a formula, it’s not THE formula. A template designed to help, but never restrict you. Each writer finds their groove as they go along, so it’s absolutely fine to take all this on board with a pinch of salt. If you don’t put the catalyst on exactly page number twelve, the script police aren’t going to beat down your door and batter you senseless with a heavy duty script guide. Like I said in my previous article, your story is unique, and sometimes the rules are there to be broken. Every creative journey starts with an idea. That little spark that strikes when you least expect it. A flash of the unknown. A scenario that makes you stop and think, did I really imagine that? Is it a leaking box in the boot of a car? Five beautiful virgins with suicidal tendencies? Perhaps it’s a character who walked, fully-fledged and wonderfully flawed one day into the confines of your head. Whether he’s a whip-wielding archaeology lecturer with a flair for enraging Nazis, or she’s more of a wall-flower with a deep-rooted depression, you’ve got the start of something, and now you need to get it down on paper. You’re probably raring to write, fingers quivering over the keyboard, ready to dive head-first into scene number one. It’s understandable. But before you start filling your head with plot points, conflicts and the real brain teasers–the aptly named: ‘Save-the-Cat’ moments, you’ll want to have at least a rough idea–the vaguest of notions– of what your script will be about, and how it will end. If you start writing before you’ve figured at least this out, things will get messy. You’ll get frustrated. Writing without a plan is like an architect building without a blueprint, you can try to build on vision alone, but all those extra hours of planning you skipped in the beginning are guaranteed to come back and haunt you later. To increase your chances of success, you’re going to need a step-by-step outline of your story. There’s no way round this, no shortcut, I’m afraid. Besides, this is the one process where you’re allowed to be as mad and as inventive as you like. If you want to add that roof sauna with the jet propulsion you’ve always wanted, go ahead. It can’t be budget-cut at this stage. Your protagonist (well, duh!). Every story needs a protagonist, someone the audience can root for, a central character your story revolves around. Your protagonist’s objective. What does your character want? Frodo Baggins wants to destroy Sauron’s evil ring, Jerry Lundegaard (Fargo) wants quick cash in hand, and Clarice Starling, from Silence of the Lambs, wants to catch serial killer Buffalo Bill. Your protagonist’s objective is the driving force of the entire production. There is no story without it. Conflict. Conflict includes all the obstacles your protagonist must overcome in order to reach their objective, usually put in place by your antagonist, whose own objectives will clash with your protagonist’s. Example: Sauron doesn’t want his ring liquefied in lava, so he’ll move hordes of orcs across Middle Earth to stop Frodo. Marge Gunderson, on the other hand, isn’t about to let Jerry get away with his crime scot-free, and Lecter sure as hell isn’t going to give up Bill’s identity without making Clarice fight for it. Conflict exists to threaten your character’s objective. It’s necessary to raise the stakes. Harry Potter wouldn’t be half so fun without Voldemort forever one-upping him, and Little Miss Sunshine would lack poignancy if Edwin hadn’t keeled over during the last leg of their journey. So where does structure come into the mix? Simply put, structure dictates the order of events that guide the hero toward his or her objective. If you look at any storyline, you’ll see that the protagonist goes from A to B to C. In layman’s terms, there’s a beginning, a middle and an end. 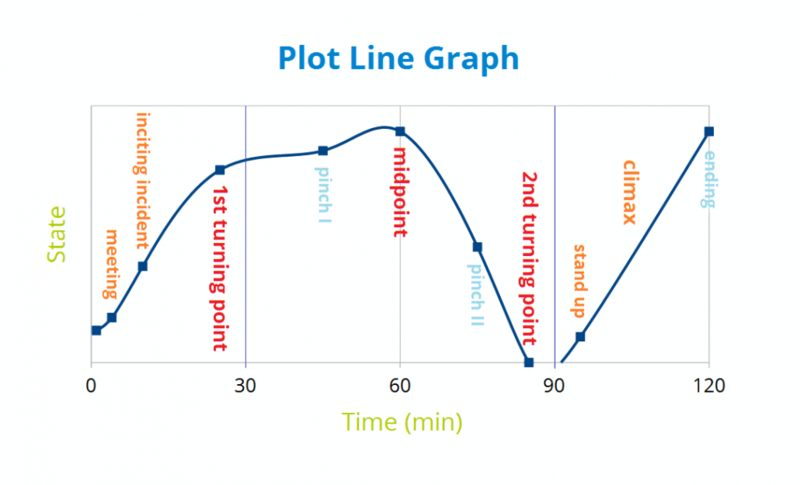 Most scripts nowadays follow the three-act structure, a formula which Syd Field, author of the Foundations of Screenwriting, claims is the glue that holds most screenplays together. This is the roadmap, and whether it’s a sketched diagram of plot points or a dozen index cards blu-tacked to your wall, it will save you a whole lot of re-writing (and tearing your hair out) later. The first act, as you can see, is the set up. You’ve got thirty pages to introduce your character, expose setting and lay the groundwork for the film’s plotline. In this act you’ll also include the inciting incident, the push to adventure, the point of no return. The second act is the confrontation. This is where most of the action goes down, where your character will get a taste of the dangers to come, where everything will go wrong, and where your character loses all hope of achieving his/her objective. The third act is the resolution. It’s the last leg of your character’s journey where the odds will turn and your protagonist will come out triumphant (or not, if you’re Scorsese). It’s where your plot reaches its maximum tension and there is an emotional or physical confrontation. Many writers just starting out confuse story with structure. We’ve all done it. We’ve all changed our protagonist’s ultimate choice, because it didn’t fit in with the structure. Beware. Plot and structure are not the same thing. Structure is applied to your story later on, once you’ve figured out the basics. What you need to know right now is your premise, your pitch. Before Harry ever got his Hogwarts letter (the inciting incident, otherwise known as the ‘Call to Adventure’), J. K. Rowling knew Harry was a wizard, and that he’d attend a wizarding school and defeat the dark lord who killed his parents. That was her story. All those red herrings dotted around Snape and Quirrell came later, structural additions which added layers of complexity to the story. This is the layout every script should have. You probably know most of this intuitively, but now go over your story and double-check. Do you know your character’s main objective? What about the obstacles? Are they clear in your mind’s eye? Story is the backbone of every successful script. Once you’ve got your premise sorted, you’re free to move onto the technical side, formatting.